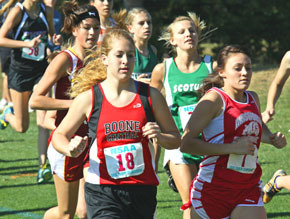 Boone Central’s girls and boys cross country teams concluded their seasons Friday with solid performances in the 2011 Nebraska State Cross Country Championships at the Kearney Country Club. The Cardinals finished 10th in the Class C girls and boys team standings and senior Jaime Kennedy brought an individual medal back to Albion. Kennedy, in just her second season of cross country competition, stayed in or near the leading pack throughout the girls Class C race with a determined pace, then used a spirited finishing sprint to earn 7th place in a personal-best time of 16:01. Although Boone Central did not have any more medalists, Cardinal Coach Tom Dickey said his runners battled gamely against tough competition and conditions. “It was a tough meet for us. 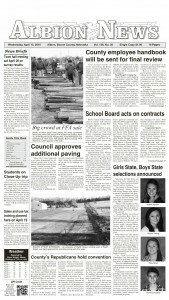 The competition was really fierce, as it should be, it’s state!” he commented. “The weather was just as fierce. I thought the kids did a great job handling both, but still struggled a bit in the heat. Dickey had further praise for Kennedy. “The race of the day, for us, was turned in by Jaime. She really had to work hard to stay in the top 15 pack, then used a really well-timed kick to zip into the top 10,” he said. “We’re all very proud of her and the progress she has made in just two seasons to become one of the best runners at any distance in the state. “Calvin Koziol made a great attempt at winning a state medal, but just didn’t have the wheels in the final kilometer to close the gap on the top 15. Koziol led the Boone Central boys by finishing 17th in a time of 17:37. Senior Brody Kelley was 58th in the Class C field in 18:53, second best among Cardinal runners. Cassidy Pribnow took 31st in the girls race with a 16:53 clocking. Complete Cardinal Results in Print & Online Editions of Albion News.